The Rim Rock Inn in the beautiful town of Torrey, Utah. at the Rim Rock Inn today. Check our rates and availability today! The Rim Rock Inn is located on the edge of Capitol Reef National Park in the beautiful town of Torrey, Utah. While staying with us, you’ll have close access to the park as well as the 10 acres of beautiful landscape, which offers a serene, rustic setting. Other Torrey hotels can’t offer such an authentic atmosphere so near Capitol Reef, Canyonlands, Boulder Mountain, and other great attractions and activities. Enjoy affordable rates, comfortable accommodations, and access to both of Rim Rock Inn’s famous restaurants: The Rim Rock Restaurant for fine dining and the Rim Rock Patio for a more casual dining experience. Experience both of our fabulous dining options! At the Rim Rock Patio, you’ll find a lot of fun along with a great casual dining atmosphere. If you’re looking for a more complete meal, the Rim Rock restaurant will cater all of your fine dining needs. 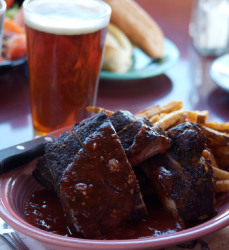 Dine at either of our Torrey restaurants after an exciting day of adventure!